The word "clone" has several different meanings in biology. As a noun, a clone is an identical genetic copy of either a piece of deoxyribonucleic acid (DNA), a cell, or a whole organism. Identical twins are clones, as are two daughter cells produced by mitosis . As a verb, "to clone" means to produce identical genetic copies of either pieces of DNA, cells, or whole organisms. DNA cloning is usually performed for one of two reasons: either to produce a lot of identical DNA for further study, or to use the DNA in an intact organism to produce useful proteins . In the first case, for example, a researcher might want to determine the DNA sequence of the gene or study the factors that control its expression (transcription). In the second case, one might want to produce large amounts of a medically useful protein, such as insulin or growth hormone . Large quantities of identical DNA can be produced via the polymerase chain reaction (PCR), but only if the DNA pieces are rather short (less than about 40 kilobases [kb], and usually closer to 1 kb). For larger pieces, or for protein production, DNA is almost always cloned in bacteria. A micro injection of foreign genes into animal cells. Similar techniques are used to insert an entire nucleus into a host egg cell. • Isolate and purify all the DNA from a sample of human cells. Break apart the cells and then wash, centrifuge, and use other purification techniques. • Cut the DNA into millions of small fragments using restriction enzymes . Each DNA piece may be as large as 10 kb, but is more commonly 1 to 5 kb. • Mix the DNA fragments with plasmids that have been cut with the same restriction enzymes. Add DNA ligase, an enzyme that joins the human DNA fragments to the plasmids and seals the circles up again. By using the right ratio of plasmid to fragment, a researcher can ensure that each plasmid harbors at most one human DNA fragment. With luck, one DNA fragment will contain the insulin gene. • Cause a bacterial culture to take up the plasmids. This can be done by ionic shock. Again, adjusting the ratio can ensure one plasmid per bacterium. The plasmid used usually carries a gene for antibiotic resistance. • Grow the bacteria on antibiotic-containing agar plates, spread very thinly. The antibiotic will kill bacteria that didn't take up the plasmid. Single bacteria give rise to colonies, which will appear as small spots on the plate. The resulting bacterial colonies are called a genomic library. • To find which of the colonies includes the human insulin gene, use a probe. This is typically a radioactive segment of DNA whose sequence is complementary to part of the insulin gene, allowing it to bind. Apply the probe, and see where it sticks. • Isolate that colony, and let it multiply in a rich broth. Each bacterium will replicate the insulin gene, providing many copies to work with. Including the appropriate promoters and other regulatory factors will prompt the bacteria to synthesize the human insulin protein, which can then be purified for medical use. Several modifications of this technique allow cloning of even larger DNA fragments. Cloning into the bacterial virus bacteriophage λ allows use of fragments up to about 20 kb. In this scheme, the bacteriophage infects cultured bacteria and directs production of the gene of interest. Cosmid vectors can package about 44 kb. These are plasmids containing special sequences from bacteriophage (λ) that promote very efficient sealing of the plasmid circle. Bacterial artificial chromosomes (BACs) can contain up to 300 kb, and yeast artificial chromosomes (YACs), grown in yeast cells, can handle up to 2,000 kb, or 2 megabases. Since the nucleus of virtually every animal cell contains the entire genome of the animal, it might seem easy enough to clone an animal by placing the nucleus in an egg cell from which the nucleus has been removed. While this was tried many times, it was never successfully accomplished until 1996, in the creation of the sheep Dolly by Ian Wilmut and colleagues in Scotland. Dolly was the first mammal created using the nucleus from a cell of a mature adult mammal. Prior to this feat, it had been thought that normal mammalian development caused irreversible changes in some portion of the DNA that prevented it from acting as embryonic DNA does. Amphibians have long been cloned from adult cells, but they invariably die in the tadpole stage. Adult amphibians, though, have been successfully cloned for many years from embryo nuclei. 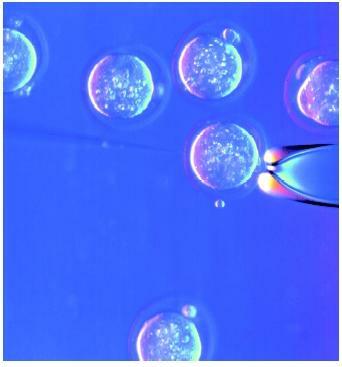 In this technique, nuclei from cells of an early embryo are extracted using a very fine glass pipette and placed in egg cells that have been shed by a female amphibian such as a frog (after removing the unfertilized egg cell nucleus). In 1998, mice were cloned from adult somatic cell nuclei, using the same technique as was used for Dolly. This technique may become especially important for producing large numbers of transgenic animals, for use in research or production of specialized proteins. However, cloned mammals are generally not very healthy. Apparently development is not quite normal when it begins with a nucleus that has already existed in another animal, compared to a genome derived from a sperm and an egg. Drlica, Karl. Understanding DNA: A Guide for the Curious. New York: John Wiley & Sons, 1997. Strachan, Tom, and Andrew Read. Human Molecular Genetics, 2nd ed. New York: John Wiley & Sons, 1999.